You may have heard that Florida residents can apply for Medicaid to pay for the costs of their nursing home care. But in addition to meeting the financial eligibility requirements, seniors must also prove that it is medically necessary for them to reside in a full-service nursing facility before benefits will be paid. Under Medicaid’s Long-Term Care Managed Care (LTCMC) plan, the costs of an assisted living facility, nursing facility, home nursing care, and medical supplies may all be paid for—provided the family can prove that the senior requires a nursing home-level of care. To do this, a senior must undergo a Comprehensive Assessment and Review for Long-Term Care Services (CARES) assessment through the Florida Department of Elder Affairs. During your CARES assessment, your loved one will be interviewed about her medical conditions, functional abilities, and the daily help she receives. The interviewer must determine that a senior’s condition is serious enough to require the availability of constant nursing care; if she does not, the senior may be denied long-term care benefits. Even after you have jumped through all of these hoops, you will still need to meet the financial eligibility requirements to receive Medicaid benefits. 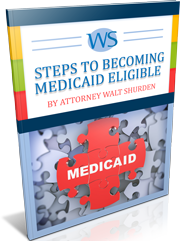 At Walt Shurden Elder Law, we can help you restructure your income and assets so that you can receive your Medicaid benefits without depriving your loved ones of their future inheritance. To get started, call our Clearwater offices toll free at 877-241-1230, or email us to have our staff contact you as soon as possible. It is not only a difficult decision to place your loved parents into a medical facility, as one can no longer care for them but it could have been extremely cumbersome process. Then Mr. Walter Shurden's Law firm was recommended to us. Walter Shurden and Kathy Gibbons were a 'God Send'. They were so competent, so professional, so informative!! They led us thru the steps, help with their enormous wealth of knowledge and from our perspective made the process much easier. I shutter to think of trying to do all that work on my own. Our request went through without a hitch, because of their experience. Our parent is safe and well cared for. Thank you Walter and Kathy.